Summer youth camps are just around the corner! For instance, Every Nation Campus Ortigas will be holding its youth camp titled “Wildfire” on May 25 – 27, 2019 at Caliraya, Laguna. In reality, youth camps can be pricy but finance should not be hindrance. How can a student like you be able raise funds? Below are list of suggestion. Yes! Pray first, remembering to ask God for provision and wisdom in doing the fundraising. God is our ultimate provider and hold on of His promises from the bible. Save money, and set aside from your allowance. You may need to make some sacrifices maybe by skipping a few Starbucks drinks, KFC meals, or movie tickets. Keep in heart that the youth camp is all worth the self investment. Keep the exciting vision of meeting new friends, having fun, having a great experience, and the life changing lessons to be learned. If you are raising Php 3,500, try to list down 35 people who can donate Php 100 each or 70 people that can give you Php 50 or maybe 7 people who can give you Php 500 each. Start the list with your family members, relatives, neighbors, and friends. Raise more than enough, so you can also bless others! Approach the people in your list, after asking them if they can donate. Ask them if they can refer you to others who may be able to help you. Ask politely for names of at least 3-5 people. Remember to politely request if they can inform these people in advance before you contact them within the next 3 days! Yes, make sure you do the follow up too! Don’t forget to thank them. Fundraise through selling. You can do this individually or as a team. Show off your baking skills like making cupcakes, cookies, graham balls, or pastillas. You can also make T-shirts or pens. Gather your slightly used fashionable clothes and accessories for a garage sale. Make sure to personalize your product by putting your name or the title of the youth camp event. Don’t just sell the product, sell the vision that you and your friends will be in the youth camp! They are investing in the next generation leaders every time they are buying your product. Make sure to mark up your price, for example if you make a T-shirt that costs you Php 100, sell it for Php 200 or more. Remember to sell the vision and that their support will go a long way. Ask your parents, relatives, neighbors, churchmates, or friends if there are chores or job you can do in exchange for a donation. I will never forget a great friend who offered car washing services a few years back just to be able to attend the camp. There were the students who help me cleaned the apartment in exchange for their registration for Victory Weekend. To what great heights are you willing to raise funds? If you and your friends or schoolmates have all the time, all energy, and resources to pull this off, why not? Be mindful that this needs a lot of preparation and consideration. This is great if you are raising funds for more students in your campus or community to attend. This is the least of all I recommend. Make use of Facebook, and let the world know that you are fundraising. Tell them that they can help you by donating or buying your product. Set a target goal amount to raise up every week. If you have 7 more weeks left, write a specific amount you need to raise. Be in faith to reach that amount and that you’ll be able to complete it before the deadline. I’m excited for you as you raise funds and encounter God’s faithfulness. Have fun and always be in faith for God’s provision. God is more than able to bless you more abundantly than what you can ask or imagine. Remember to honor Him and worship Him as well as you give your tithe, remembering that it is God who gives you this provision. More than 10 years ago, during 2009 prayer and fasting week, I prayed and believed for the impossible to happen in my life and that was to go back to college and get a degree. During that time, I was working as a call center agent and helping provide for my family in the province. The financial challenges in my family drove me to give up the dream of a college degree and accept the weight of being the breadwinner. But it was through a class in church back in 2007 that once again reignited that desire. Since then it has been constantly brewing in my heart, a hopeful thought that haunted me for two years. My response to this thought was resistance and saying how could it be possible? Considering the weight of responsibility I felt for my family. Who would support and help my family if I pursue my desire? At the 2009 prayer and fasting, I said to God, yes I want it, and I want to continue. Started believing in my heart what can be, rather than what cannot. I felt it was God calling me on this and it was Him who put this desire burning in my heart. The one who called me is ultimately faithful and in that I rested. A month after the prayer and fasting, my mom called me up to share her good news! She was hired to work in Macau as a domestic helper. The month that followed was another answered prayer, my sister’s education in a private school will be fully supported financially by a relative until she graduates. Isn’t that great? God took off every hindrance, showing that truly nothing is impossible with Him. That year I resigned from work and went back to college as a full time student. The journey wasn’t easy, there was plenty of hurdles along the way, but the very words of God brought sustenance and strength throughout the journey. Today I am grateful that I had made that decision to respond in faith. I am thankful that God enabled me to move in hope in a seemingly cornered and hopeless situation. This experience enabled me as well to see God in action in my life. But truly the best decision I ever made was the moment I accepted Jesus Christ in my heart as my Lord and Savior back in 2006. I would not have the faith to believe for the possibilities If I did not embrace his Lorship over all things . I am in Christ, so is my life and all it’s circumtance. At the end of the day, we all make faith decisions. • Never make life decisions base on personal limitations. • Pray and trust God in all circumstance. • Obey and act in faith in accordance to God’s words and promises. What decisions are seemingly challenging and impossible for you, but will make you thankful in the years to come? New year means new beginnings. While it is wonderful to ponder and write down things that we are thankful for the previous year, it would also be great to reflect on our failures, frustrations, pains and discouragements. We need to free ourselves from all the baggages that have been weighing us down. We can do this through honest reflections and acknowledgments that will lead us to humility before God and Him freeing us from such things. This way we can truly move forward to a year filled with hope and soar high. Start fresh, back to zero. We should start the year free from familiarity to face new challenges. Don’t hold on to your trophies, recognitions and achievements because our past successes may not help bring us to success this year. In other words, what got you here may not necessarily get you there. Let us desire to have a heart that is excited for new mountains to conquer – now with a greater dependence on God in being successful and not only from years of experience. Sometimes we rely on our past successes more than relying on God. In our previous journeys, we may have encountered frustrations, disappointments, discouragements and hurts. Today, it is time to let go. Let go and let God. God, being above all these things, is everlasting and powerful. And when we start to acknowledge that God is at the center and that He is the One who orchestrates all things, we will have peace knowing that He is perfectly in control. He knows better and He knows best. As we allow Him to rule in our hearts, He will give us peace, restoration, strength, healing, new direction, and He will also fill us with a new sense of hope. Failures do not define us. We won’t have success all the time. Human beings are limited and bound to fail one way or another. However, failures should never define you neither give you your identity. Rather, we can take them as learning curves to help us become a better person. We only truly fail when we fail to see the beauty and the lessons these shortcomings bring us. Only God has set your value and you are always priceless before Him. As you start the year, be in faith for greater things. And as you journal your faith goals, dare to believe big, dream big, and expect big things. Hold on to God who rules, reigns and creator of all things. Rest in His promises with expectant hearts for the object of our faith is of incomparable greatness beyond measure. May you have a joyful new beginnings this year! INSPIRING STUDENTS | How they are making ends meet. Tutorials: One of the opportunities they grab a hold of is offering tutoring services, which may have started from simple sessions with a neighbour’s child to recommendations from relatives and friends. This grows until a network of connections is built and more formal opportunities to tutor are established. House Chores Services: One of the many options to take into considerations is doing house chores. You need not go far as the best place to start is within neighbourhood,and within a network of relatives and friends. Selling: Some of the things I personally did during college was to make and sell homemade sandwiches. I also sold frozen goods supplied by a friend (tocino,embotido, and longanisa), even adobong mani packs. Other students sell perfumes and other goods. One student from STI would sell balut, just to make sure he has his daily allowance. Part time jobs and rackets: Some students I’ve met, constantly, make use of their skills such as singing, event hosting, playing musical instruments, acting as event clowns, event coordinators, and even doing random errands for someone. Working in a fast food chain: This is one of the most common options for most students, but this is also one of the most challenging. Sometimes, work shifts come before or after class, and because of these challenging schedules, students don’t get enough sleep. One should carefully consider the academic load when entering into a job like this. I had batch mates who took quite some time in college, juggling studies and work as server or cook. When I was a student, my classmates who did this were my constant reminder to be grateful, to be inspired and to persevere. Call Center Jobs: There are still a few graveyard warriors who continue to inspire many people, juggling their graveyard shift and studies. When I was working at a BPO company, I was surprised to see an employee in student’s uniform, only to find out that after the shift, she would go directly to class. I can only imagine how all her sacrifice was not in vain as I’m sure she has gone far in pursuing her dreams. Scholarship Grants: There are so many scholarship grant available out there. If you’re a student looking for one, try checking your options starting from the school, barangay program, to the local government and research on non-government organizations focused on helping deserving yet underprivileged youth. God did not leave us powerless against lack or poverty. The determinant of our richness and success is not our environment nor lack, but in our identity in Christ. Through Jesus Christ, we can rightfully claim every promise of God in the Bible. In Jesus Christ, we will be able to live a storm proof life. In him we are made victorious. At the end of the day, It is the object of our faith that will sustain us and will make us victorious. I could not recall the rest of her prayers. But it indeed struck me, because it was clear to me that God was speaking through her. Doing ministry is not easy, It can be very overwhelming and I have honestly come to a point of pleading to God to take it away, or at least, make it a bit easier. It was a breaking point. But every time I talk with God, He constantly reminds that it is He who orchestrates everything in my life, including the overwhelming challenges in the ministry. It is He who placed me here and that He did not make a mistake in assigning me that weight for the task. 1. Recognize that all challenges that come to you are allowed by God. · Go direct to God above who entrust this to you. Seek Him with all your heart. Ask to give you wisdom and guidance on how to handle the challenge. Recognizing that all these challenges were allowed by God, will make you see that it is also God who can deliver you out of it. Take to heart that it is God−ordained. 2. Respond with the right heart. · How we respond to challenges matters. We can either keep on complaining or take on the challenges and thank God. As God has entrusted the challenges, He will enable you to perform it. Heart check is crucial as we respond in this journey. God is maturing our faith and relationship with Him. 3. Be courageous and strong. · God’s Word to Joshua, as he took on the new leadership role was “Be very strong and courageous in all your challenges.” Remembering that God is with you in every step of the way will encourage you to be strong and courageous. Do not be intimated with what will come your way, for the Lord your God is with you. 4. Be excited for what God will teach you through your challenges. · Keep in mind that this faith journey comes with amazing learnings and revelations, no matter how difficult and impossible it may be. One of the benefits of facing challenges is breaking of wrong mindsets. Most of the time I find myself limiting an unlimited God, then I repent and realize how God is expanding my faith. We are just in the first quarter of 2017 and I find myself delightfully excited to what comes my way. Do not close doors yet for challenges, for God is mighty in your life and He will deliver you through it. This was the main call for my fellow missionaries and I during our first meeting for the year. Realizing how excited we are to carry out our tasks and victoriously overcome the challenges in our responsibilities in the campuses and in the church (and of course to achieve our respective personal goals), it is also equally important that we reflect on what our hearts truly desire for this year. Why does our service matter? And, what is the heart behind our service? In these verses, we are reminded to serve, not to promote our own interest and reputation, but to serve the interests of others. Whether you consider yourself a leader or not, we are reminded to serve GOD and not man. How can I serve God by serving my teammates and leaders more? How can I be a blessing to God by being a blessing to my campus, my community, and my family? If we find our hearts gearing towards focusing on our own interests and what we will gain in exchange of our “service” to God and others, it would not hurt to take a few steps back, to rethink and recalibrate our hearts with this Scripture and with Jesus. By overcoming pride and honestly assessing the motives behind our services, we become more like Jesus, our ultimate example of humility and genuine service. As we have more and more of Jesus in us, there becomes less and less of us each day as we continue to serve. Again our motives matters most to God than our actions. For Christians, may we always be reminded to imitate our Lord and Savior Jesus Christ and to serve the way he did – selflessly. Christmas is indeed the most wonderful time of the year, Where most families gather together and having a meaningful celebration, the birth of the savior. It’s the time of the year we look forward to be re-united with our loved ones and spend dinner together. But what if this Christmas, you are home alone or far from family and loved ones? What if a family member has passed away and you don’t feel celebrating Christmas. What if because of irreconcilable difference with loved ones makes it impossible to be together? What if you found out some one in you love is dying out o cancer or going through legal battles? God is good even when circumstances is bad. No matter how bad things are around, we can always rejoice. 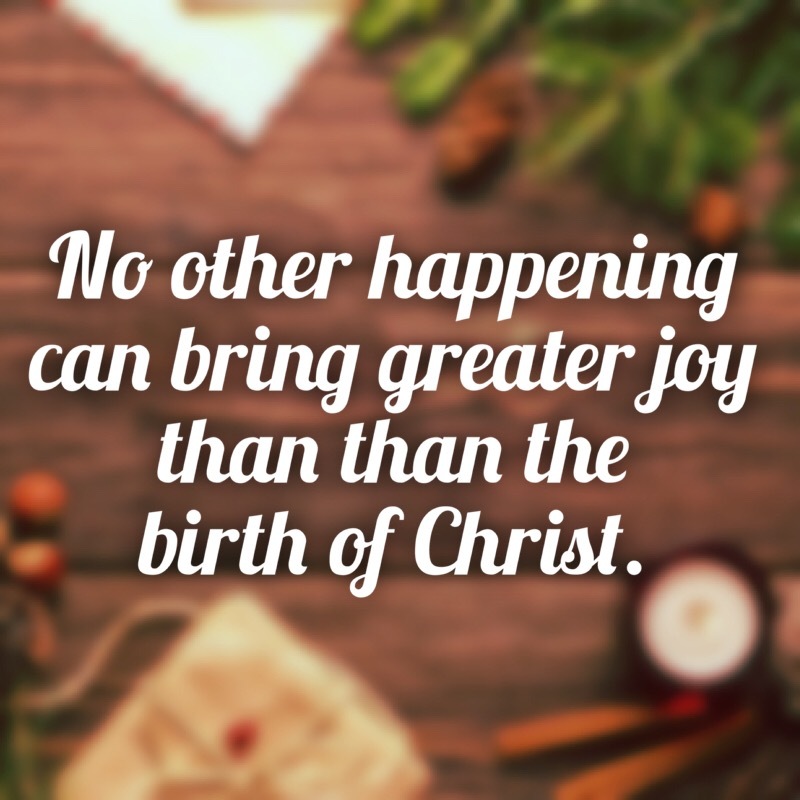 The birth of Jesus Christ is the only happening that can bring greater joy. He came for the forgiveness of our sins, the hope of our salvation. In him we have redemption and freedom. In him we have peace. He is the testimony of God’s mercy and goodness to us. In Jesus Christ I have found the very reason to rejoice, the comfort and strength. His love and goodness is so overwhelming, I can’t help but rejoice and be filled with gratitude. This is the invitation of Jesus for each and everyone. If you only rejoice when you feel like it, and circumstances warrants it, you will never rejoice much and you will miss a lot of joy. For when you rejoice in the Lord and focus on Him, joy begins to flow out of your inner being and strengthens you.The Joy that is more than having peace and security, unstoppable in all circumstance, that is incomparable in all things, that can only be found on Jesus.